OSE TFL Popeye heavy duty flex cable assembly. This is for customers using 4s-6s Lipo power or a modified TFL Popeye boat. 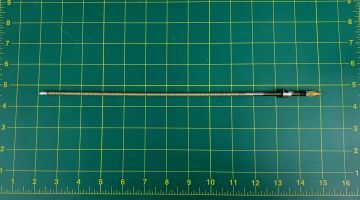 This cable is made with thicker gauge .187" Cable assembled to a 3/16"(.187) prop shaft and bullet nut. The cable we use is over 15% thicker than the stock TFL 4mm cable. NOTE: This will NOT fit a Stock TFL Popeye without the following modifications. Requires: ose-81518 5mm to .187 Coupler and removal of stock Teflon liner.